My latest archival journey began with a simple question: Can I get a colour version of the maps? I did not anticipate where this question would lead. I hope in sharing some of my story on this blog you will see the basis of the message and intent of future posts. This blog is called Archive Matters but I could just as easily called it Archives Matter. In very real ways archival repositories hold in trust documents and materials that are needed by the research community. As a researcher for a First Nations non-profit, and as a member of the a First Nations community, I have had the privilege to see every day why archival documents are important to our work. I think my story shows this best. On a trip to the British Columbia Archives I reviewed a reel of microfilm from Series MS-1425 ‰ÛÒ Franz Boas papers relating to American Indian linguistics (http://search.bcarchives.gov.bc.ca/franz-boas-papers-relating-to-american-indian-linguistics). On this reel I found “Notes to the maps of the Pacific Northwest” by James Alexander Teit. I thought the notes and maps would be useful to my work so I made copies of both. I was perfectly content with my copies until I started working with the documents. Annotated and full of marginalia, the maps, stripped of colour (they had been annotated and coloured with pencil crayons by Teit), were confusing at best. As any community researcher knows, every single line on a map matters. Decisions are made every day based on maps and interpretations of those maps. Maps can be wonderful things. Taken out of context, maps can be very dangerous things. In this instance, my community was particularly interested in understanding the background to a published map that was being used to assess the strength of our claim to part of our asserted traditional territory. These maps, hastily copied from a reel of microfilm, mattered. To better read and understand the maps I thought, Can I get a colour version of the maps? 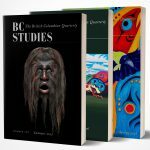 I checked the BC Archives catalogue to see if they hold the original documents. Unfortunately, they do not. Looking further, I found that the originals are held by the American Philosophical Society in Philadelphia. Knowing very little about the APS, it is not a place I would have ever checked for documents about my community. Not only is it on the other side of the continent, but it is also located in another country with no obvious connection to my community. Before contacting the APS I thought I would see if others had already tracked down the colour maps. Reaching out to my network of colleagues I found that I wasn’t alone in my quest for good copies of the maps. Other communities within my Nation were on their own journey to understand these maps. Pooling our efforts, the Union of British Columbia Indian Chiefs worked with the Nlaka’pamux Nation Tribal Council and we approached the Library of the American Philosophical Society in Philadelphia where the original copies of the maps are located. It took a bit of time and money, but eventually we successfully obtained colour versions of the maps (See for example http://diglib.amphilsoc.org/islandora/object/graphics:6285). The colour version of the maps helped our research progress. Finally, we were able to see a legible representation of James Teit’s understanding of our territorial boundaries. But the maps, and associated notes on the same file were not enough. I thought, If the APS has such wonderful maps, what else do they have that might give context to Teit’s work? It was this question that put me on a path that I still travel today. Browsing the APS catalogue I discovered that they hold the original Franz Boas Papers (Mss.B.B61 http://www.amphilsoc.org/collections/view?docId=ead/Mss.B.B61-ead.xml). I reviewed microfilm copies of some of this collection in the past but never in any detail, nor had I ever seen the originals. Coincidently a colleague heard about a large project to digitize and produce a documentary edition of the Franz Boas Papers (http://www.franzboaspapers.uwo.ca/). We were invited to a meeting with project partners from the University of Western Ontario, the University of Victoria and their community partners from the Musgamagw Dzawda’enuxw Tribal Council. At this meeting we met others interested in better understanding the work of James Teit with First Nations communities. Rather than describing the journey since then, I will share the highlights. Working with the Indigenous Advisory Council of the Franz Boas Papers team, I had the good fortune to work with a group of community scholars and researchers. I found a group as interested, and concerned with understanding the work of James Teit as myself. Working together, we have discovered more maps, letters, notes, photographs and links to other archival collections that have allowed us to put Teit’s work in context. I have visited archives, small and large, across Canada and North America finding more records created by Teit and written about my community. Using these records I have found his unpublished notes where he discusses how he came to understand, and later in his career revise his understanding of, our tribal boundaries. The best part of this story, the most important part, is that copies of these documents are now in the capable hands of my community. My community has incorporated much of the material into ongoing work, including traditional use study research, a draft cultural heritage policy, place name projects, genealogy work and mapping projects. My community now has the tools that they need to put Teit’s maps and work into context. This for me is the best example that I can share of why archives matter. This highly personal introduction to the blog Archive Matters is just one example of why archives matter to our communities. Most research starts with a simple question, but as we learn more about archival collections and the communities and people that make use of them, our research can take us on unexpected journeys with unexpected results. Just as I would have never thought to look for maps important to my community at an archives like the APS, each question that other communities ask may bring them far from home. To begin our journey together with this blog Archive Matters I have shared my story. My goal moving forward with this blog is simple. With the help of other researchers, archivists, community knowledge holders and interested parties I want to help other communities find documents that will make a difference to their own work. Let us see where this journey takes us next.